Introduces you to the Common Written Exam (CWE) being conducted by IBPS (Institute of Banking Personnel Selection) for 82 Regional Rural Banks (RRBs). Focus of the current blog post is on providing you the prep materials for IBPS CWE RRB Exam for Officers - it at first discusses about the Pattern of CWE and than goes on to give you the Sample Papers & Prep Books for the same. Before going further, let me tell you that this Common Written Exam for the Rural Banks is being organised by IBPS for the first time - hence previous years exam papers of IBPS CWE RRB Exam and also books are yet to appear in the market. But there is a much similar exam - IBPS Common Written Exam for PO & MT, which was conducted last year on 18th September, 2011 - you can use the sample paper & books for IBPS CWE for PO/MT for Officers exam of IBPS CWE RRB. Why am I advising you to use the prep materials for IBPS CWE for PO/MT for the Regional Rural Bank Exam? It is because the exam pattern is identical - with same test sections and the mark distribution is also similar, if not identical. Pattern of IBPS CWE PO Exam is as shown at right. i) Objective type test of 250 questions worth 225 marks. Duration 2-1/2 hour. ii) Descriptive type test worth 25 marks. Duration 1 hour. This exam pattern is identical to the pattern/format of CWE for RRB as given below. You might have found out that, this exam is being held for four categories of Officers as given at right. The exam pattern of them are almost identical, except minor differences as can be noted below. 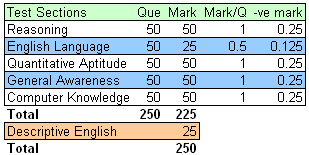 There are five test sections as shown at right with 200 questions for a total of 200 marks. For the language paper, you can choose either English language or Hindi language. The duration for the exam is 2 hours & 30 minutes. If you compare the above IBPS CWE RRB exam pattern to that of IBPS CWE PO exam, you will find that both are identical, except that number of questions are less - 40 question per section in CWE for RRB Officer Scale-I while for PO exam, the same was 50 questions. The exam pattern is same as above,except that section "Quantitative Aptitude" is now called as "Quantitative Aptitude & Data Interpretation". Also section "General Awareness" is replaced by "Financial Awareness". As this exam is being conducted for Specialist Officers (i.e.Chartered Accountant, Marketing Officer, Treasury Manager, Agricultural Officer), so there is a test section for the "Professional Knowledge". Mark per question has been reduced for Test of reasoning & Quantitative Aptitude & Data Interpretation, com pared to above for RRB General Banking Officer (Scale-II ). 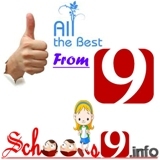 This exam is conducted for experienced officers (i.e.with 5+ years experience). However, you will find that all the test sections and the mark distribution is same as that for the fresher level Officer Scale-I, the exam format as given above. As told in the beginning of this blog post and you could find yourself in above discussion, all the test sections of IBPS Common Written Exam for RRB Officer is exactly same as that for the Probationary Officers. Hence to find Sample Papers & Prep Books for IBPS CWE for RRB Officer.